After identifying the areas which need to be manufactured with an electrode, enclosing the area with a 2D or 3D boundary provides a quick and simple way to arrive at the required electrode geometry. Graphical face selection is also available to permit easy extraction of the more complex areas. Understanding that VISI Electrode is a tool to compliment the experience of electrode designers, VISI combines automation with the ability to manually construct geometry and apply it to the electrode. This technology combination provides the user with the freedom to edit the design and ensures that it will always be possible to complete the electrode design. An intuitive interface guides the user through the creation of the electrode nose. Options are available for adding extension height with either vertical or tangential extension. For open-sided electrodes, multiple extrusion directions are available for side extension. At any point within the electrode creation process, dynamic animation and collision checking is available. The electrode base and stock are interactively added to the electrode. Electrode name, material, burning operation type, identification marks, edge chamfers, position and rotation can all be applied. Any information added is automatically carried through the electrode project to the final HTML report. Holders can be constructed manually by applying width, depth or height, or simply selected from an extensive library. Where access for the electrode is limited by neighboring surfaces, the holder can be offset from the centre of the electrode to provide enough clearance for the EDM machine to operate. Dynamic animation and collision checking ensure that the complete electrode does not violate the part geometry. The EDM manager provides the operator with a tool to manage the work piece, electrode, multiple electrode positions, vertical, horizontal and angled simulation, collision checking, HTML report and EPX output. 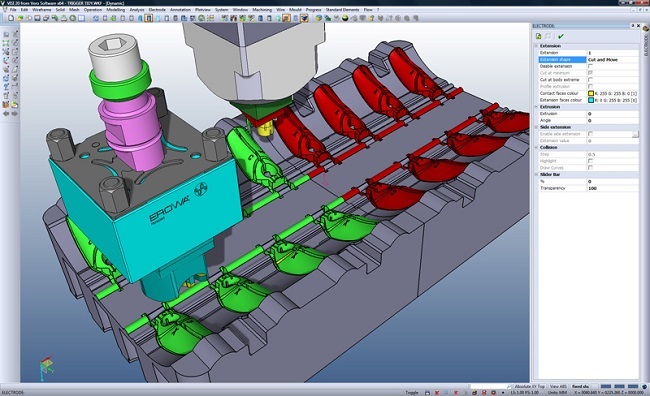 To ensure compatibility with other CAD/CAM systems, each electrode can be automatically exported relative to the correct workplane using a neutral data format such as IGES, STEP or STL. To ensure that the electrode and holder are correct, the electrode can be graphically animated along its axis of operation. Automatic checking will test for interference between the electrode and neighboring surfaces. Any collision will be graphically highlighted and the electrode will be moved to the point of contact. Once the electrode has been designed it can be machined directly (without any unnecessary data transfer) using VISI Machining. A datum for machining and positioning the electrode in the EDM machine is automatically created to ensure continuity throughout the entire manufacturing process. Machining templates containing tooling, tool path operations, feeds, speeds, depth of cut, etc, can all be stored for re-use on similar electrode families. Applying them to a new electrode will automatically create a new set of toolpaths using the same settings, greatly reducing programming time and using company standards which have already been proven on a previous job.